"Wagner, no! Stay in hell where you belong!" Although he started out directing pretty straight forward films like Billion Dollar Brain & The Music Lovers, Ken Russell's career took a turn for the surreal with 1971's criminally under seen & underrated The Devils. In 1975, he released two films featuring Roger Daltrey, the lead singer of The Who. The first was a film adaptation of that band's 1969 masterwork rock opera Tommy. 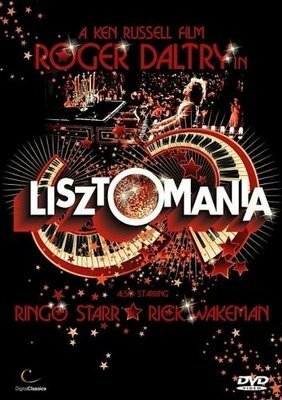 The other is another under seen film, yet one that I would hesitate to call underrated: Lisztomania. To say that Lisztomania plays fast and loose with historical events might be the biggest understatement I've ever made. The film takes a devilish delight in being historically inaccurate. It posits Hungarian composer Franz Liszt (Daltrey) as the first "rock star" in music history, giving him legions of ravenous fans & an insatiable libido that rivals that of Jim Morrison, Mick Jagger & virtually any other rock star you could name. The film is not really a musical, if for no other reason than it brashly defies categorization of any kind. In the film, Liszt becomes fast friends with fellow composer Richard Wagner (Paul Nicholas), and after falling victim to her feminine wiles, he intends to wed the Russian Princess Caroline (Sara Kestelman). After eloping, Liszt is summoned to the Vatican, where the Pope (Ringo Starr) condemns his marriage, and forces him to work exclusively composing music for the Catholic Church. The Pope calls Liszt into action, however, when a plan is uncovered in Germany wherein they are using Wagner's music to conquer the world. Wagner, reincarnated as a Frankenstein/Hitler hybrid, is unleashed & begins using an electrical guitar/sub-machine gun to kill thousands of innocent people. This sets up the ultimate showdown of good versus evil, Catholicism versus fascism, love versus hate. To say I'm oversimplifying this film is the second biggest understatement of this review thus far. His seduction at the hands of the Russian Princess involves a dream sequence of sorts where he is sucked up into her nether-region & tormented. The film opens with one of the more bizarre swordfights ever committed to film, and only gets weirder from there. By the time Liszt rides a twelve foot long phallus through a cabaret number, you'll have to have made the decision whether or not you're willing to go along for the ride (no pun intended). Is there a method to the madness? Yes and no. Russell tends to be the sort of director who tries to cram every possible bit of symbolism into his films until it's almost all rendered meaningless. He condemns fascism with his right hand while also equating it with religion with his other, until it all becomes a jumbled mess. Lord knows who he was targeting with this film, but at the same time, it gives one pause to ask, who wasn't he targeting? At the same time, however, the film cannot be dismissed outright. Visually it's an accomplishment like very few others. It's interesting to juxtapose this film with last week's Baron Munchausen, as Terry Gilliam is very clearly a visual disciple of Ken Russell. It's influence can also be felt in the surrealist films of Guy Maddin, The Brothers Quay, Ralph Bakshi & Jan Svankmajer. Even a film as prestigious as Amadeus can said to have been influenced by this film's free-wheeling, rock star lead composer. The performances are about as good as can be expected from two musicians like Daltrey & Starr. Never the most gifted actors, they make up for it with their boundless charisma. Keep an eye peeled for some great cameos from Russell regular Oliver Reed, and Nell Campell, or Little Nell, from Rocky Horror Picture Show. The most unfortunate thing for those of us residing in the US is that this film is extremely hard to come by. I have a VHS copy of it, but it's never seen a Region 1 dvd release. There are several foreign dvds available & it's even on blu-ray, but you may have a hard time tracking down a copy of the film. If you do, I entreaty you to open your mind and give yourself over to the absurd imagery on display. If you think for a moment that you're expected to take any of this seriously, you're missing the point of the film entirely. Just bask in its weirdness and allow yourself to be transported to a time when major studios were giving directors like Russell millions of dollars to realize their singularly strange vision. I wouldn't hesitate for a moment to say that such a time will never come again.